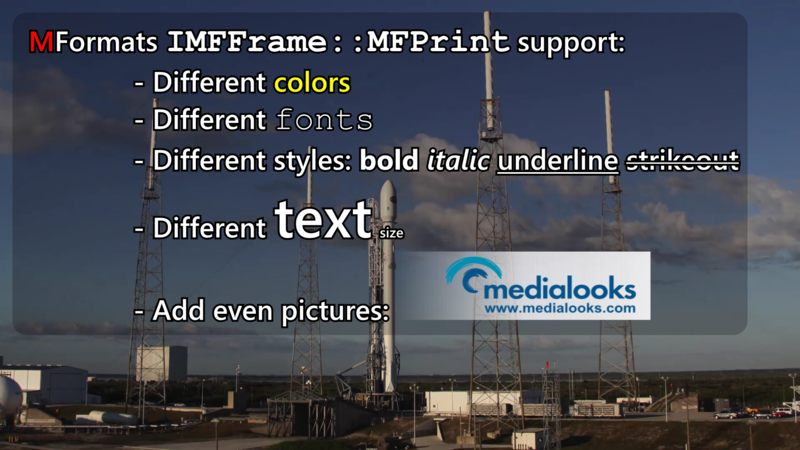 You can add text overlays to a video frame by using a single method - MFPrint. _bsText – the text you would like to overlay. _dblTextSize – font size measured in relative units, where size 1.0 is 1/24 of screen height. _pRect – the rectangle area (MF_RECT) where the text overlay will appear. _eMFTextFlags – a set of additional flags (eMFTextFlags) to align the text. text (font) – style defined by parameters: face (e.g., "Times New Roman", "Arial", "Tahoma", etc. ), size (in ems) and color. img – embedded image with required parameter src = <path to image> and optional parameters width, height and size = <height relative to text line> (e.g., if size = 2.0 image height will be equal to double text line height). Additional parameters are introduced as a string in order to achieve greater flexibility: adding new formatting options will not change the code for calling the method. face – font name, such as 'Times New Roman', 'Arial', etc. weight – font weight with possible numeric values from 0.0 to 2.0.
italic – italic type. Possible values are true and false. bold – boldface type. Possible values are true and false. oblique – bold italic type. Possible values are true and false. stretch – font-stretch with possible numeric values from 0.0 to 2.0.
word-wrap – automatically moving the word to the next line if a line of text is filled. Possible values are true and false. line-spacing – line height, or distance between one baseline to another. Possible values are from 0.0 to 10.0. By default, the line height is 1.0.
baseline – the distance from the top of the line to baseline. By default, the baseline is 0.8.
align – horizontal alignment of text. Possible values are: left, center, right and justify. vert-align – vertical alignment of text. Possible values are top, center, and bottom. color – font color. HEX-code value ('0x00f0ff') or color list ('red', 'green', 'blue', etc.). Can be defined with a transparency level in brackets: 'red(50)', '0xffffff(80)'. outline – width of text outline measured in relative units, where outline=1.0 is an outline with the width of 1/240 of screen height. outline-color – color of text outline. HEX code value, for example, '0xff0000' or color list (red, green, blue, etc.). Can be defined with a transparency level in brackets: 'red(50)', '0xffffff(80)'. bg-color – background color. HEX code value, for example, '0xff0000' or color list (red, green, blue, etc.). Can be defined with a transparency level in brackets: 'red(50)', '0xffffff(80)'.